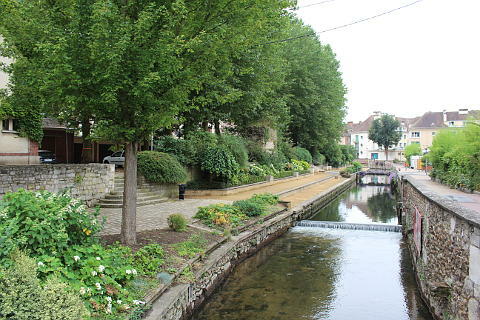 The town of Evreux is pleasant to visit, and although it is best known for its two most important monuments - the cathedral and the episcopal palace - you will also find several other monuments of interest and enjoy a stroll along the river banks. 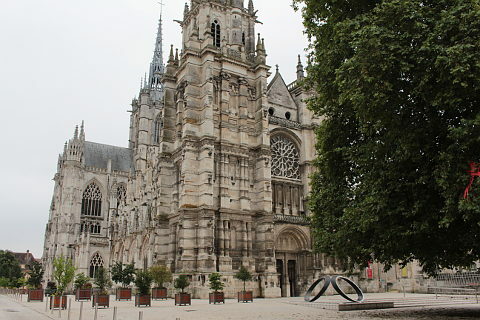 The town is inland in eastern Normandy, in the Eure department (of which it is the capital) and about 50 kilometres south of Rouen. There are several marked paths through the the town and along the banks of the River Iton to help you make the most of your visit. 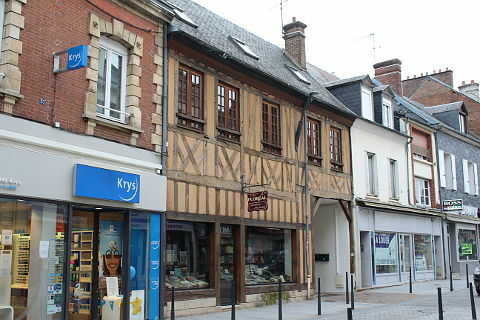 You can get more information about the highlights from Evreux Tourist Office. 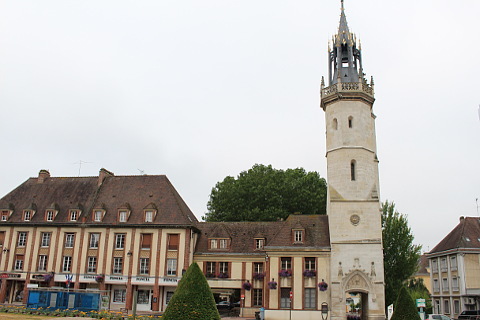 You will start your visit in the town around the town hall and the interesting belfry. This has been built in flamboyant gothic style in 1497 and is 44 meters high. From here take the pretty walk along the waterside and as you follow this towards the Miroir d'eau you can see various vestiges of the ancient ramparts as well as a number of bridges and ancient washhouses. 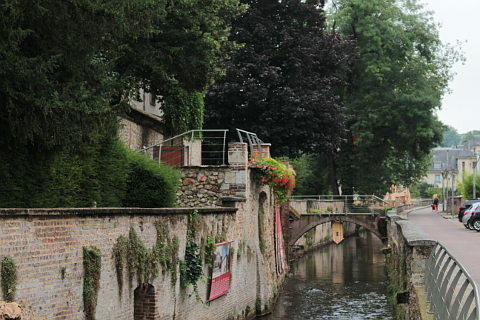 At the Miroir d'Eau you can enter the Episcopal City, which is the heart of the town. 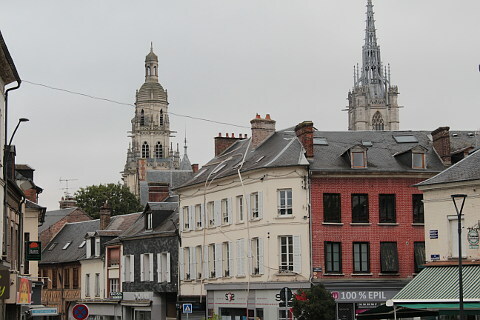 This part of Evreux contains two important monuments: the cathedral and the episcopal palace. 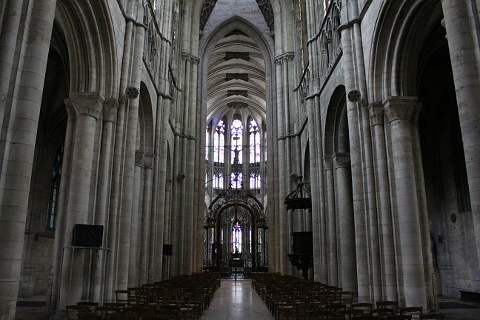 The imposing cathedral was originally built in the 12th century, although damage at the end of that century, then again during the wars of religion, and finally during the second world war, mean that the current cathedral has undergone significant rebuilding over the centuries. Each period has left its mark, and there is much of interest to see when you visit. The first thing you will see is the exuberantly decorated outside of the north facade and the 15th century lantern tower, both in the so called 'Flamboyant-gothic' style of architecture. Other particular highlights include the 16th century entrance on the western side of the cathedral and the stained glass windows (including a bright yellow glass which is particularly associated with this building), the ornate 'rose' windows and the pretty cloisters. This grand palace dates from the 15th century with significant 19th century additions. Part of the palace is built on the gallo-roman rampart. It too is built in gothic style. 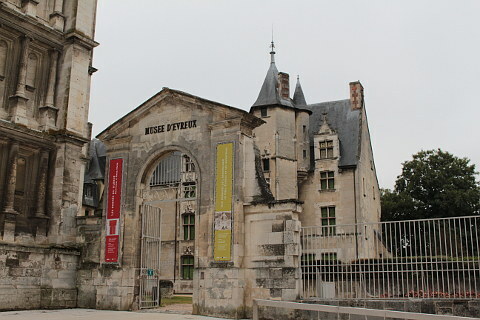 Within the Bishop's Palace you can visit the Evreux town museum which is an Art and history museum and exhibits a fascinating collection of historically interesting local objects and also some notable abstract artworks. 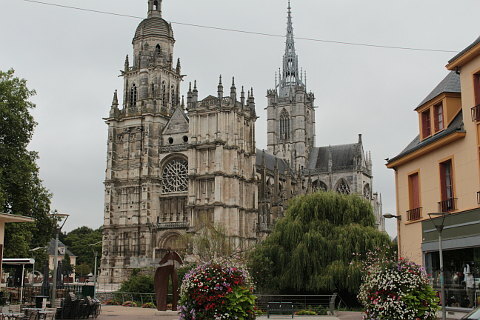 Another important religious monument in Evreux is the abbey church of Saint Taurin . 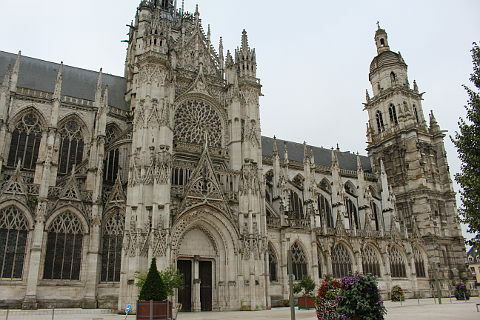 Not unlike the cathedral, the church also covers a wide range of architectural styles and periods of construction, with the decorative 12th century entrance being among the oldest parts of Saint Taurin church. Among the highlights inside the church are the substantial medieval baptism fonts and the stained glass, and you can also see an interesting 'model' of a gothic church, about a metre long and ornately decorated with silver which is a shrine containing the relics of Saint-Taurin. In the town centre there are various medieval half-timbered buildings and near the belfry is a decorative fountain and the imposing town hall. 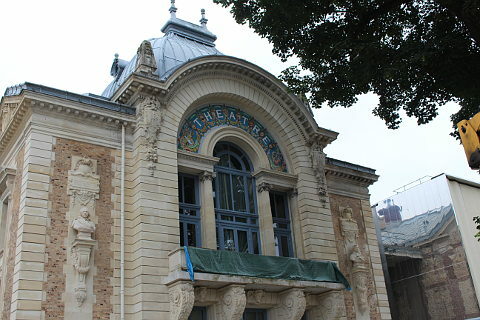 The theatre too is an impressive building built in 1903. 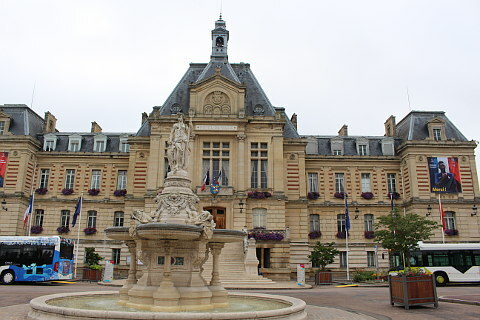 The market in Evreux is held in Place Clemenceau in the town centre each Wednesday and Saturday morning, and we suggest that you visit on these days if possible to see the town at its liveliest. Interesting fact: Jimi Hendrix kicked off his first tour with the Experience in the town of Evreux, 13 October 1966 - an event commemorated by a plaque in the town. Before you leave Evreux if you have time head north to the hills above town called the "coteaux de St-Michel". From here you get a splendid view back over the town. There are numerous attractive walks and cycle rides possible in the surrounding countryside. Ask for information at Evreux Tourist Office. Gardeners will enjoy a visit to the gardens at the nearby Chateau de Miserey, while about 30 kilometres to the east of Evreux are the famous Monet gardens at Giverny, the most visited gardens in France. To the north-east of here you should visit Chateau-Gaillard at Les Andelys, one of the most imposing medieval castles in France, while to the south-east of Evreux you can visit the large renaissance style castle at Anet.